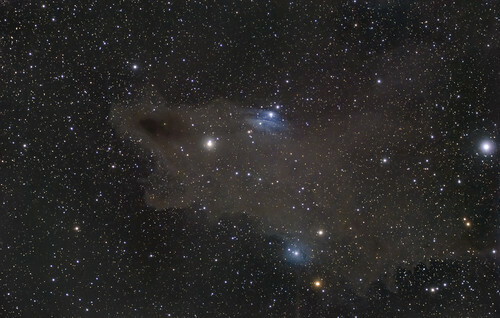 LDN 1235 - The Dark Shark Nebula in Cepheus is a complex of interstellar dust. The blue reflection nebulas VdB 149 (bottom) and VdB150 (top) set nice accents. Pentax K3ii, TS 130/910 apo with 0.79x reducer. 100 x 300s @ ISO 800.